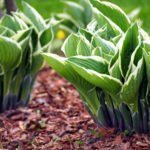 I have a small shade garden with many hostas. One particular part of the garden has the hosta plants being broken off at ground level. I look in the morning and more stems are broken and lying on the ground. It looks as though something is digging small holes in the earth near the plant, but I don't know if it's the pesky squirrels or some other critter, or if that has anything to do with the problem. I've had this garden for 20 years with never a problem! I have a similar experience here in Dallas. Does the hole lead to a tunnel or is it just surface soil movement? If a tunnel, could be voles. If just a small area dug out, I am suspect of rabbits. I have one that is caught in the back yard and althought he is small, he is growing. He prefers certain varieties - I guess they are the gourmet choice. Are the leaves being eaten? Or just broken off. Squirrels would probably not eat leaves but could be burying winter food and disturbing plants. Guess you could dig a little in the hole and see if anything is buried. I don't think I am helping much - am sympathetic, however.